Life is unscripted, raw & real. 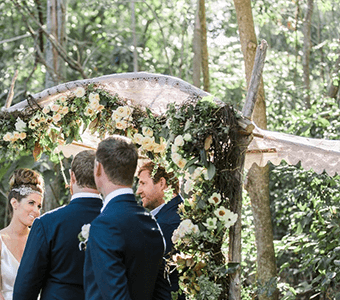 So why should your wedding ceremony be any different?! Creating ceremonies that celebrate the connection you & your partner share, I’m always honoured to stand beside a couple as they take the next step in their lives. But you’re not here to read about me! 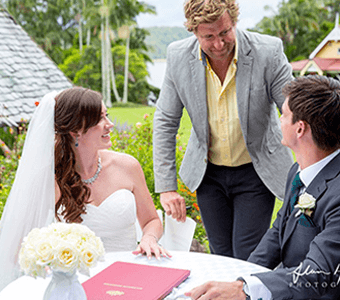 You’re here because you’ve got a big day on the horizon & it’s time to lock in a celebrant. I could tell you I’m different. I offer value for money to keep wedding costs down. I deal with everything from large, traditional weddings to intimate elopements. But so does every other celebrant you’ve researched! So here’s what I will tell you. If you’re looking for any of the same things, let’s have a chat. Storytelling & narrative skills - With decades of experience working in media. Fun & Friendly - A wedding is a big party, so let’s enjoy it. Authentic - What you see is what you get. Endless Choices - Got an idea for the big day? Let’s make it happen! A supporting role - This day won’t be about me. Ever. 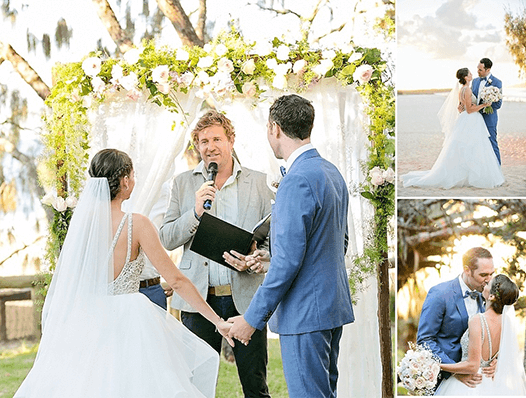 Beach based - From Noosa to the Gold Coast, your local celebrant. It’s your day, so we’ll do it your way. 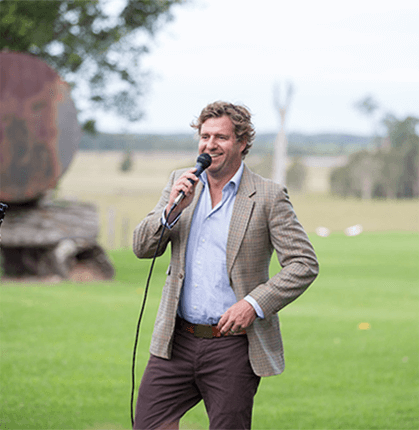 As a wedding celebrant I avoid cliches like the plague (apart from that one). I don’t use tired scripts and write a ceremony that’s rich with your values as a couple and shares your unique journey. Whether you want a traditional ceremony or something quirky and unique, we’ll create something relaxed and fun together. Whether expected or not, saying goodbye to a loved one is never easy. With care and compassion as a funeral celebrant I help bring comfort during tough times. 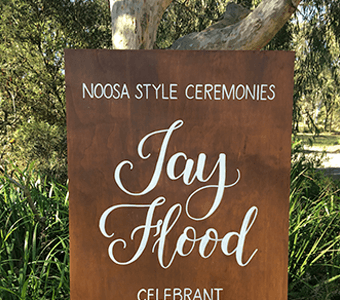 When it’s time to celebrate a life I can help craft a ceremony that’s personal, sincere and respectful while still uplifting, inspiring and full of love. Intimate and special, elopements aren’t about running away from it all but getting away from it all. It may be the spot you had your first date, or simply a location that means the world to you both. 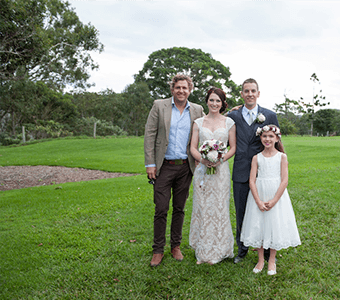 Wherever it is, as your elopement celebrant we’ll start your married life with a romantic and private ceremony that ticks all your boxes. To legally marry in Australia, you are required by law to sign and lodge a Notice of Intended Marriage (NOIM) form. This will be one of the most important items to tick off your wedding ‘to-do’ list to ensure you tick all your legal boxes. Download the NOIM form below. The NOIM must be signed by both parties being married, and witnessed by me, as your chosen celebrant. This must be done no earlier than 18 months before the wedding and no later than one month before the wedding. 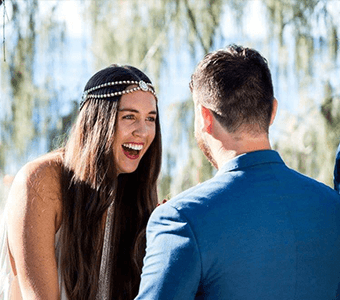 Following your ceremony I will lodge your signed NOIM, as well as the Official Certificate of Marriage signed at your ceremony, and any other relevant legal papers, so that your marriage can be legally registered. You must be over 18 years of age to legally marry in Australia. We’ll chat over the phone or face-to-face. Whatever works for you! I’ll let you know how my process works and give you a chance to see if we’re a good match. You’ve booked! That’s one less thing to worry about. I’ll fill out all the dull legal stuff for you. It’s no worries. All you have to do is sign on the dotted line. We’ll catch up for another chat so I can hear all about your love story. I want all the good stuff! I’ll turn this into a personalised wedding script that follows your journey. 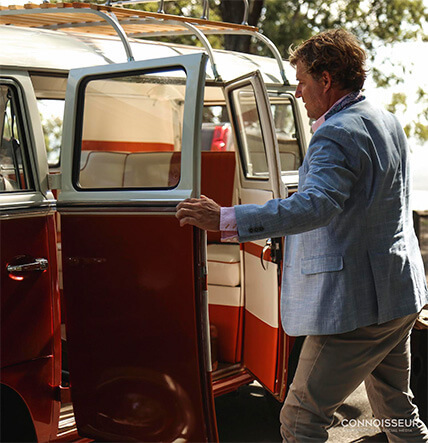 I’ll bring the PA and the warm, genuine touch for your guests to see, hear and enjoy. The wedding ceremony you imagined. We’ll raise a glass to you, the happy couple (you did it!). I’ll do everything I can to provide a stress free, loving and memorable ceremony. A real, relatable and fun wedding ceremony that you and your guests will love. Catch ups, Skype, phone calls, text, email – whatever we need to make sure the ceremony is unique. Music Playlist and the ability to play your ceremony music through Bluetooth audio. All legal paperwork and lodgement of appropriate documentation with Births, Deaths & Marriages. My fees are mid-range and provide great value for money. I’ll be able to show you exactly where your money is going during our complimentary first meeting. Once we’ve discussed the type of wedding you’re after I’ll be able to provide a more accurate quote. From there, if you’re not happy with the price you’re welcome to keep looking for a celebrant. I’d still love to hear about the wedding! I am based in Noosa, on Queensland’s Sunshine Coast. 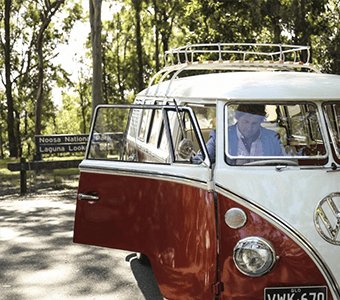 Don’t worry if you’re not based in Noosa, I’m happy to travel to help make your wedding unforgettable, so please contact me to find out how I can help. Do we need to pay for our first meeting with you? No way! Your wedding will only happen once (ideally!) so you need to be certain of every wedding supplier you choose. Our first meeting is a chance for us to get to know one another and see if we click. Whether over the phone or face to face you can tell me all about your plans and I’ll do my best to help. Absolutely. A traditional wedding ceremony is not for everyone. As long as you have submitted your Notice of Intended Marriage Form no earlier than 18 months and no later than a month before your wedding, you will be all set. Don’t forget to arrange for two witnesses over the age of 18 to be present too. How much creative input can we have for our ceremony? No one knows your relationship better than you and your partner, so it makes sense that you should both have your say. I cringe at generic wedding ceremonies that sound robotic and dry. If you’ve got ideas - whether for your vows, your wedding script, or something else entirely, then I’d love to hear them. Having said that, if you prefer to leave the ceremony planning to me, I’m comfortable with that too. I typically arrive between 30 minutes to one hour before the ceremony is due to start. This gives me a chance to test the PA, check in with you and your partner, help grandma to her seat - whatever I can do to help!